There aren’t many big cities on my travel wish-list. After a while, they start to look the same. And yet, every time I travel to a new city, my one and only goal is to see as much of it as I can. Most touristy cities are centered on a point of interest – the Statue of Liberty, Tokyo Tower, or the London Eye. Most recently, for me it was the Opera House. And here’s how I experienced the city in six ways. This is my least favourite way to experience any city. If you’re driving yourself, you’re too focussed on trying not to crash, than turning your head every way to take in all the sights and sounds. I found myself keenly observing traffic and pedestrians, and tried not to think about throwing up. Sydney is a haven for pedestrians. Walking around the city, I marvelled at the urban planning mandating green space, stopped to gasp at the occasional fluffy kookaburra, looked through shop windows at stuff I could never afford, and drifted past the unmistakable smell of Aussie barbecue. I stopped to say hello to every pit bull without a leash, who looked up at their owner for approval to play with me before trotting off to sniff the poodle 50 meters away. I eaves-dropped on businessmen giving financial advice on their cell phones and tourists looking through maps. I peered over the railings at Darling Harbour to spot glum jellyfish. I watched a concerned teacher instruct a group of students to be on their best behaviour outside the Opera House. I gazed up at the windowless offices as lunch-break joggers dashed past me to grab their sandwiches and slip back into work in heels. I sat on a park bench and watched the city’s bright lights take over as the sun crept behind an office building. I experienced Sydney’s soul on foot. I just wish I had the sense to pack waterproof shoes. The wharfs are like bus stops for ferries. The ever so slowly changing views of the city, the Opera House and the Harbour Bridge initially threw us into a picture-taking frenzy. Then it gave a sense of what the first explorers must have experienced and visualised. 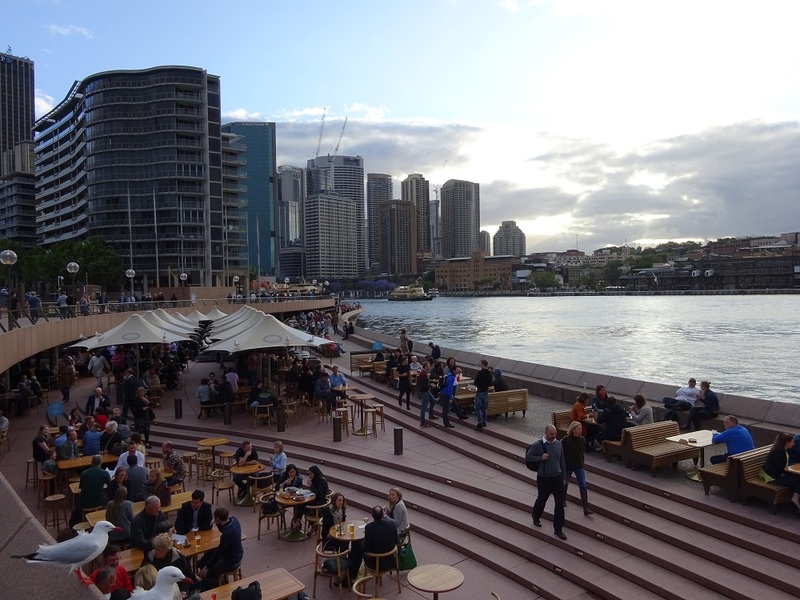 The Sydneyites sat ‘indoors’ rolling their eyes at tourists on the deck with selfie sticks. By the third ride, my heart went out to the locals who take the ferry every day, who have surely mastered how to say “OMG, look it’s the Opera House” in every language possible. For about 25 dollars, the Sydney Tower presents a view from the highest point in the city. We got there 10 minutes before the storm clouds roared in and lashed cold rain onto the cityscape. A blip compared to the tropical rains we came back to in Chennai, but it was impressive to witness them from so far above the ground. From the dry safety of the Tower, we watched tiny people scurry for cover and a rainbow of umbrellas make a beeline for the shops. It was also a dream opportunity to test all the features on the camera and get some incredible shots for scrap books. Or, the “Adventures in Sydney” Facebook album. In its effort to streamline city travel, Sydney has got pre-loaded travel cards. The Opal Card gives you access to buses, ferries and trains. Trains are possibly the best way to get a peek into a city’s society. I expected zero contact and an overdose of floor-staring but Sydney’s passengers surprised me – they seemed unexpectedly compassionate towards mums with bawling toddlers flailing to get out of their prams. We took most of our trains from a tiny suburban station called Banksia, where we met the friendliest station manager ever. He chatted about the weather, travel cards, which station managers to talk to, and even escorted us to our train. I later Googled him out of curiosity, only to find news features on the boundless kindness of Banksia’s station manager – a local celebrity of sorts! Peer pressured into this one, I don’t regret spending the 210 dollar at all. It had only a little bit to do with the handsome, six-foot-something Bondi Resue Aussie pilot in aviators! From high up above, you quickly realise how dependent Sydney’s planning has been on its water. Thanks to Bose’s noise cancellation magic, the 25 minute air tour of this coastal city is an unbeatable way to witness its scale and beauty. Bobbing white boats dotted every bay, while surfers floated about waiting for big waves – quintessentially Aussie. My brother-in-law claimed to have spotted dolphins, but since no one else could corroborate, we’ll just let that story slide.